When Margaret Strong died in 1969 – her personal collection of toys had grown to about 300,000 pieces. Strong, a native of Rochester, New York was largely fascinated by dolls. (Her massive toy collection contained at least 22,000 of them.) Her dolls, toys and other play-things began what is now known as the National Museum of Play. 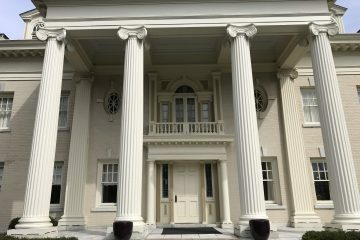 Chief Curator Chris Bensch guided me on a private tour of the 285,000 square foot facility before the doors opened to the public one morning in early October. 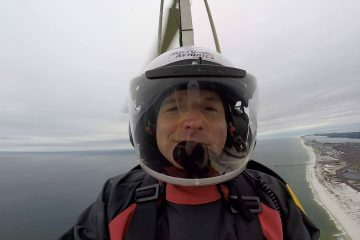 ‘The number one comment we get from visitors is ‘Hey, I had one of those! 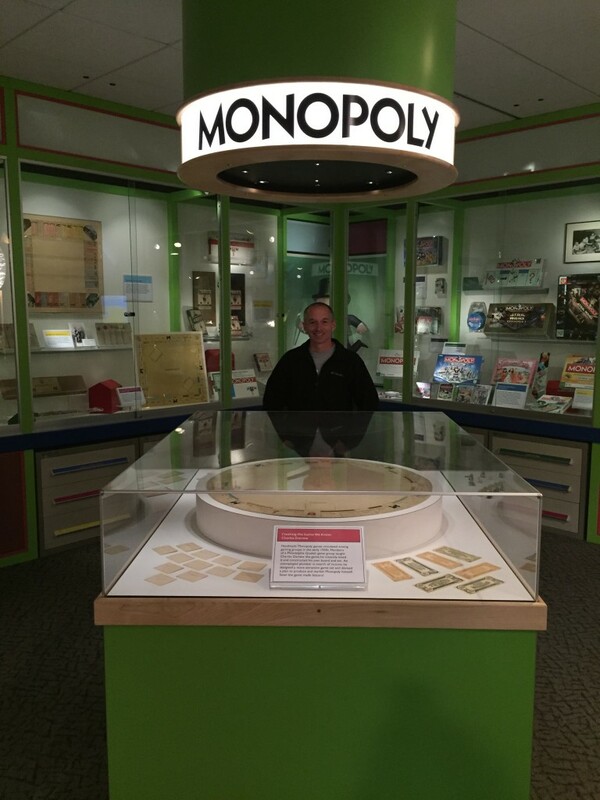 '” said Bensch as we posed for a photo by the very first Monopoly board on display on the museum’s second floor. Though very few guests, if any, had the early Monopoly board which is circular in shape as opposed to the traditional rectangle game board we’re familiar with today. 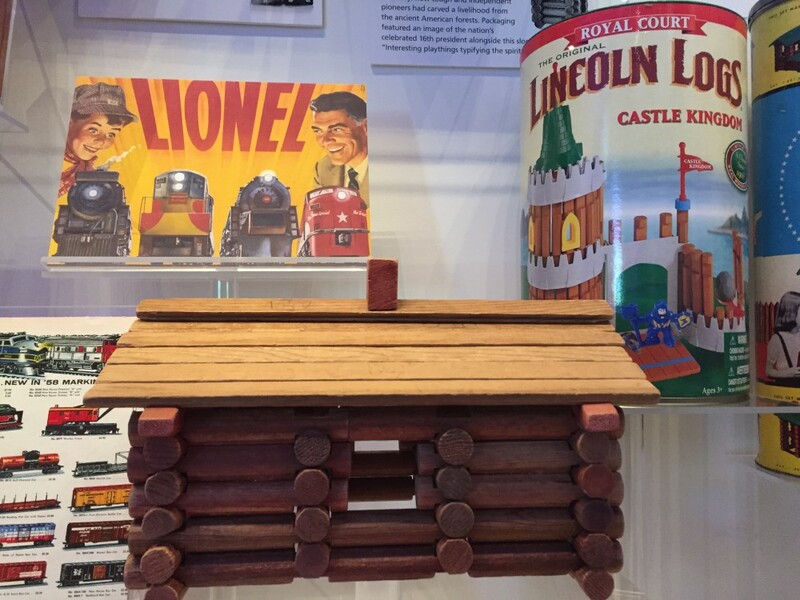 However, the majority of items on display are certain to connect with childhood memories of most museum visitors. The exhibits feature everything from classic toys like the Slinky, Mr. Potato Head or a cabin made of Lincoln Logs to rare finds like a 1960’s Batmobile or the world’s first jig-saw puzzle. One section features classic video games that guests can play for a single token. (5 tokens for a buck – what a deal!) Your options include arcade games like Pac Man, Teenage Mutant Ninja Turtles or dozens of other notable titles. There are rows of pinball machines scattered about the entire exhibit and fun sports games like a foosball table or the old hockey game where you spun your players around with knobs while a tiny puck gets flung about inside a giant glassed-in dome. This is without a doubt a “hands on” museum. Younger kids are known to run first to the replica grocery store directly inside the front doors. Kids can grab items, scan them at the check out counter and roam about with miniature shopping carts. Another area lets kids (of all ages) use state of the art technology to move items on a giant video screen simply by moving their hands in the air. You can even pretend you’re Superman climbing a wall using a green screen and e-mail your friends a photo. In addition to preserving items related to play – the museum facilitates the study of play as well. One sign on the wall poses the question “Where’s the crime wave?” – a reference to violent video games. Concluding that studies in fact show the opposite effect – crime rates dropping, as much as half, during years when video game sales tripled. The museum also explores the history of things that require imagination but can be remembered just as fondly as an expensive, modern day gadget. For example – did you ever play with a cardboard box as a child? Or perhaps use a blanket for a fort? Both items are inductees into the Toy Hall of Fame – which includes other simple play things like a box of crayons and a rubber ball. On the other end of the spectrum – revolutionary toys like the Easy Bake Oven and the Nintendo Game Boy are among the 56 items that have been voted in to-date. 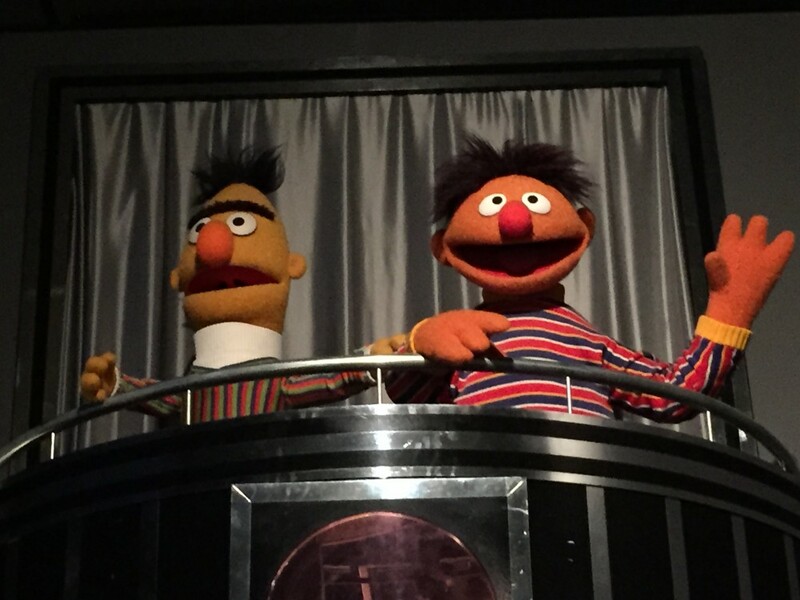 The Museum of Play currently has over 450,000 items in its collection. 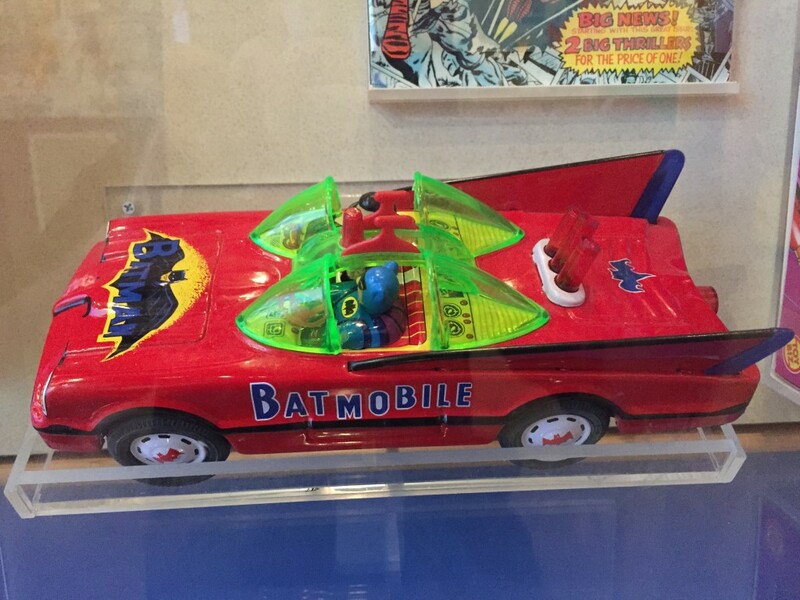 A 1960’s Batmobile toy with Batman & Robin figures inside. The Museum of Play has an entire wing dedicated to super heroes like Batman and Superman as well as collectible comic books and toys. 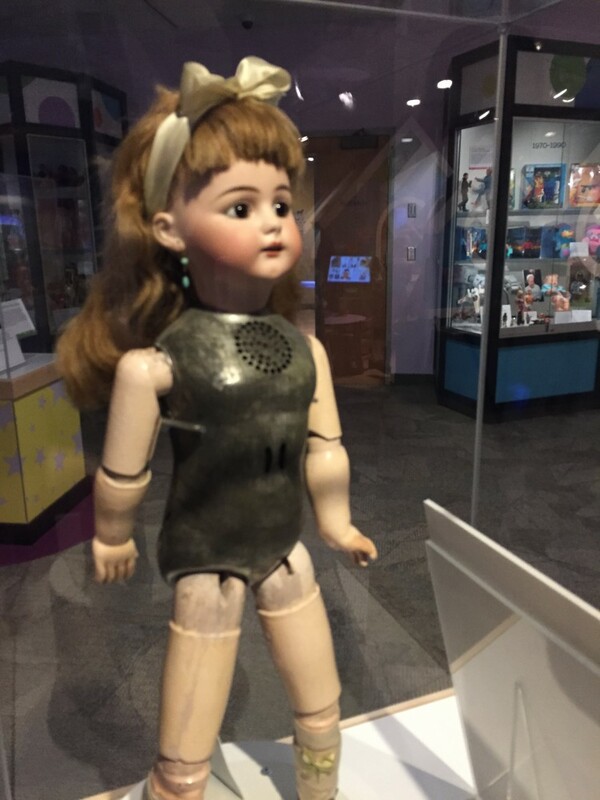 The first “talking doll” designed by Thomas Edison in the late 1800’s. The creepy looking little girl has a voice box inside her chest. A super cool wall of framed video screens that appear to be still images but move on occasion. 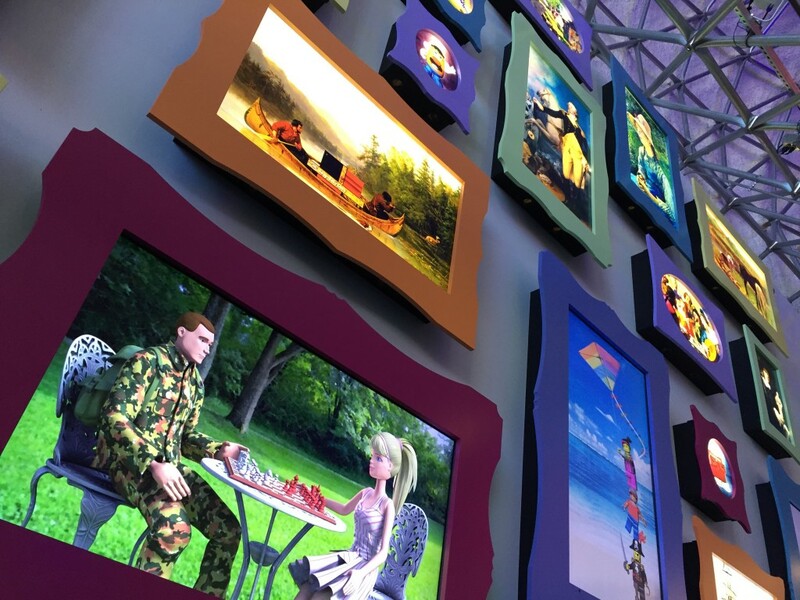 GI Joe is playing chess with Barbie in one of the displays. The Strong National Museum of Play is located at One Manhattan Square in Rochester, New York. It’s open daily with adult admission costing $13.50. Museum members are free. Other admission discounts are available on their website.